This guy writes for a living. Sometimes for food. Satire, Technology and Science fiction. You will be inclined to shelve Nnedi Okorafor’s The Book of Phoenix between The X-Menand Frankenstein. A companion to Okorafor’s Who Fears Death, which won the World Fantasy Award in 2011, The Book of Phoenix tells the story of Phoenix, one of the mutant “speciMen” a future government has created for nefarious purposes. SpeciMen—invariably of African descent— are experiments, medical curiosities, living farms for donor organs, or freaks of nature imprisoned in specially designed cells, but Phoenix is different. Phoenix is a weapon. An “accelerated organism” who looks 40 despite being only two years old, she was created in a lab for the purposes of destruction. It spoils nothing to reveal that Phoenix soon turns her destructive powers against her captors. The Book of Phoenix is the latest in a long tradition of stories about escaped monsters who take revenge on the society that created them, and Phoenix’s journey follows a pattern readers of these stories will recognize. After demolishing her prison, Tower 7, in a spectacular scene reminiscent of the wrath of Dionysus—trees and vines, spurred into bizarre growth by the powerful radiation she emits, overpower the skyscraper and tear it to pieces—Phoenix attempts to live a normal human life, or as normal a life as one can have when one has suddenly sprouted wings. She goes out for Ethiopian food, flies to Africa, and settles in a small village in northern Ghana, where she falls in love. Phoenix’s trip to Ghana is ostensibly motivated by the alien seed she discovers in the wreckage of Tower 7, but this section of the book also functions as an idyll, a brief chance for Phoenix to experience “real life.” The fact that the seed wills her to carry it there and plant it in Ghanian soil only literalizes what would otherwise be a metaphorical attempt to put down roots. This fusion between the literal and the metaphorical is a defining feature of The Book of Phoenix, which is divided into two parts: the primary plot, an expressionistic fable that more than once relies on mystical explanations, and a frame narrative set even further in the future, when Phoenix’s story is finally discovered. The former is a work of pure, oral storytelling; it is extracted from Phoenix’s own memories and told in her own voice. To quibble about the elements which don’t make sense, or make too much sense—Phoenix, for example, is named not only for the city in Arizona where her surrogate mother lived, but for her ability to emit massive quantities of heat and light; that she also coincidentally sprouts wings in a development which catches everyone by surprise—is to misunderstand the genre of the tale being told. Phoenix’s story operates at the level of myth; here, poetic logic reigns supreme. When the organization that created Phoenix—a group whose panoptic influence is underscored by their name, “The Big Eye”—catches up to her and murders the man she loves (well, one of them), her Ghanian sojourn is cut short and the novel’s revenge plot kicks into gear. Reunited with two other speciMen from Tower 7, Saeed, who can only digest substances like rust and ashes (imagine the lovechild of Rappaccini’s daughter and Matter-Eater Lad), and Mmuo, who can walk through walls, Phoenix sets out to bring down the Towers. Her journey brings her to the Library of Congress, to the prison where her mother is dying from the cancer she contracted as a result of carrying Phoenix, and to the Tower where speciMen children are raised for their organs. It’s here that Okorafor makes what may be the book’s boldest move by incorporating a character heavily influenced by the story of Henrietta Lacks, a kind of vampire’s victim who is herself immortal. The suggestion is that Lacks, whose cancer cells were posthumously harvested for scientific research, exists on a continuum with the speciMen, and that the events of The Book of Phoenix are the culmination of centuries of exploitative research practices. This is a story of vengeance, a fantastic epic battle between good and evil; written as a fable for the future, it doesn’t leave much room for moral complexity. That comes in the frame narrative, in which Sunuteel, an old man in a post-apocalyptic desert, discovers Phoenix’s “book”—the audio file containing her narrated history—in a cave of discarded computers. What Sunuteel does to Phoenix’s monologic narrative fundamentally changes its meaning, and, in the process, shifts the focus of the novel. Is this a book about Phoenix, or is it a book about books? Okorafor is deeply concerned with what stories can and cannot do. Phoenix is a voracious reader, one who, in the Tower, consumed books at an accelerated rate to match her accelerated growth. Her adventure hinges on a trip to the library; of course some of its most compelling passages would turn out to be meditations on writing and storytelling. The tension between Phoenix’s memories and the book Sunuteel makes of them adds an extra layer of interest to this inventive dystopia. The universe is expanding and will continue to do so until it is a cold and seemingly empty void. As best as we can tell, this is the destination of all existence—the “where.” But the “why” and the “how” are still somewhat of a mystery to cosmologists, and a new 3D map of the known universe spanning nearly two billion light years could help solve these puzzles. Edwin Hubble discovered that the universe was expanding in 1929 based on redshift observations of distant stars—the further away a star is, the wavelength of light changes. Holding everything else constant, redshift observations painted a picture of a steadily expanding universe. In the 90s, Hubble’s theory was forwarded by better redshift observations that suggested a universe that was expanding faster and faster. But the story doesn’t end there. New observations have suggested that the universe isn’t as uniform as we thought, and that it’s expanding more slowly than once calculated. These deviations from the “Hubble flow” are called peculiar velocities, and we’re just beginning to investigate them. To that end, astrophysicists at the University of Waterloo constructed a comprehensive 3D map of the universe using predictions from the 2M++ redshift catalogue. Tracking the uneven expansion of celestial bodies will be key for investigating not just peculiar velocities, but also the location and amount of dark matter in the universe. Dark matter is thought to make up 26.8 percent of our universe, and yet we can’t see it. It doesn’t interact with normal matter, and so we can only observe it based on its interactions with other objects that we can detect. A comprehensive model of the universe would allow researchers to better predict where dark matter lies in the void. But, if you’re not an astrophysicist, you can always just enjoy a peek at what the universe would look like if it was sliced in half like a melon. More than a decade after it left Earth, the space probe MESSENGER is in the dying days of its exploration of the planet Mercury. The spacecraft is about to run out of fuel, and after a planned final manoeuvre on April 30, it will plummet into the surface of Mercury out of view of watchers on Earth but will remain in contact until 10 to 15 minutes prior to its demise. Unlike the other well studied and photographed planets, Mercury has until recent times remained mostly unexplored. 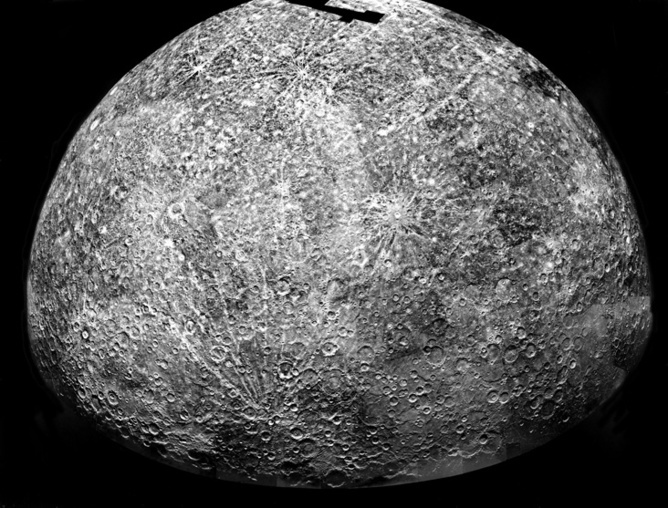 The planet – just 57.9 million km from the sun – was first visited by NASA’s Mariner 10 probe which undertook three flybys of Mercury between March 1974 and March 1975. 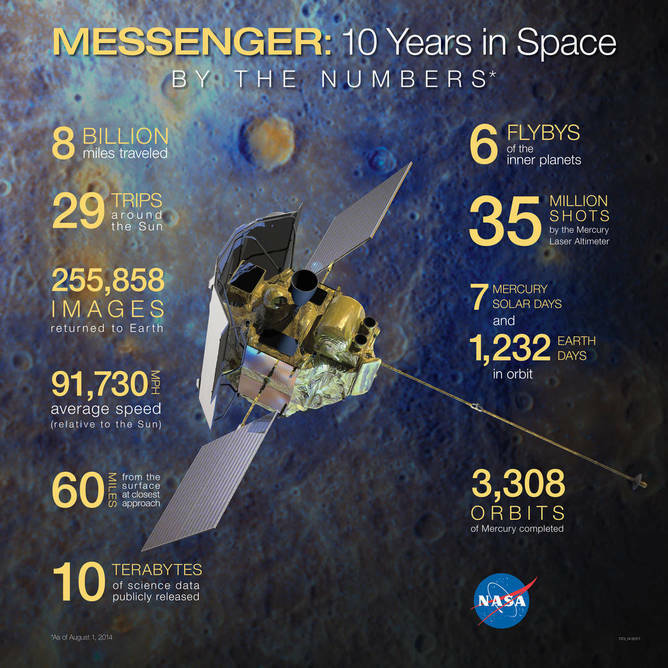 The planet had to wait for more than 30 years before MESSENGER (MErcury Surface, Space ENvironment, GEochemistry and Ranging) completed its first flyby in January 2008. Today you can even study its craters and other surface features using the Google Earth interface. MESSENGER was launched on August 3, 2004, weighing 507.9kg, 1.42m tall, 1.85m wide, and 1.27m deep. It is powered by two body-mounted gallium arsenide solar panels and a nickel-hydrogen battery. The probe carries a number of science instruments to map the surface of the planet and its magnetic field, detect atmospheric gases and various elements of Mercury’s crust, and much more. After its launch, the spacecraft flew by Earth once (in 2005), Venus twice (in 2006 and 2007) and Mercury three times (twice in 2008 and once in 2009). This multi-flyby process greatly reduced the amount of fuel needed to decelerate, although at the cost of increasing both travel time and distance. Planets such as Venus and Mars have atmospheres that enable the minimisation of fuel by utilising atmospheric friction to enter orbit. But Mercury’s atmosphere is far too thin for such manoeuvres. Using gravity assist manoeuvres at Earth, Venus and Mercury provided the necessary reduction in velocity enabling it to use its rocket engine when entering its elliptical orbit around Mercury. The insertion into a highly elliptical orbit minimised the amount of fuel necessary and allowed time for the probe to cool down after passing between the planet and the sun. It also allowed measurement of the effects of solar wind and Mercury’s magnetic field at varying distances, as well as capturing close-up measurements and photographs of the surface and exosphere. After travelling 7.9 billion km and orbiting the sun 15 times MESSENGER entered Mercury’s orbit on March 18, 2011. The science instruments were reactivated on March 24 and the first photo from orbit was returned to Earth a few days later on March 29. 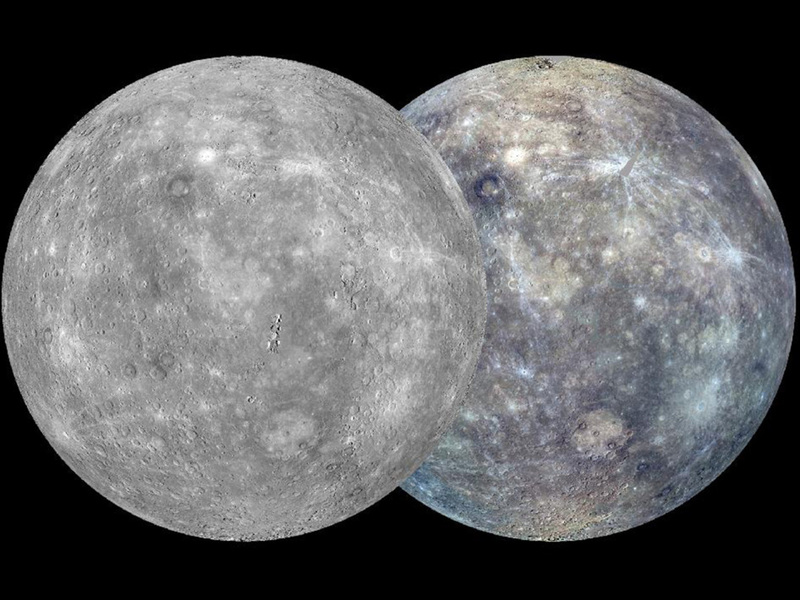 The MESSENGER flybys of Mercury in 2008 and 2009 were able to confirm the earlier Mariner 10 results that Mercury had an internal magnetic field and also to show that its magnetic dipole – which is just like a large bar magnet – is aligned to within 5° of the planet’s spin axis. In an early flyby in 2008 there was a totally unexpected discovery that there were large amounts of water present in Mercury’s thin atmosphere. Visual evidence of past volcanic activity on the surface of Mercury and evidence for a liquid iron planetary core added to the incredible discoveries. in November 2012, NASA announced, evidence of water iceand carbon-containing tar-like organic compounds molecules at both of Mercury’s poles. In these areas the deepest parts of the craters are always in shadow with temperatures reaching as low as -200C. This discovery lends weight to the idea that Mercury, like the Earth, was bombarded by water-laden comets and mineral rich asteroids during the early years of the solar system. The original mission was initially for a year and then extended to allow for observations of the predicted 2012 solar maximum. The solar maximum is the period during the normal 11 year solar-cycle where the number of sunspots, solar flares and Coronal Mass Ejections are the highest. These are the major indicators of solar activity and MESSENGER was in a prime position to get information about the effects of increased solar activity. In November 2013, Messenger was one of a number of spacecraft used to observe and photograph both Comet Encke (2P/Encke) and Comet ISON (C/2012 S1). A second extended mission was scheduled to last through to March this year and has taken advantage of the probe’s orbital decay to obtain highly detailed close-up photographs of ice-filled craters and other landforms at Mercury’s north pole. And so after a mission lasting almost 11 years the tiny robotic probe MESSENGER will end its mission on 30 April by crashing into the surface of the planet. Even then data will be gathered: the new man made crater the probe crash makes will hopefully provide new information for the NASA scientists. 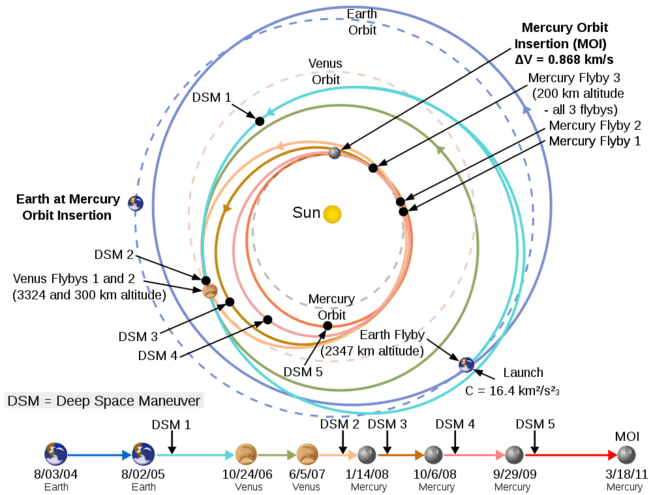 On its final orbit the probe will be only around 250 – 500 m above the surface at around 14,500km/hr. NASA scientists will continue to gather data from MESSENGER until it finally succumbs to Mercury’s gravity. This raises a question: just as comet and asteroid impactors may have delivered organic matter to their targets, what possible contaminants will this human-made visitor introduce? Since 1958, with the increasing potential of discovering extraterrestrial life, there have been groups of scientists such as Committee on Space Research (COSPAR) examining the foundational ethical principles involved in the exploration of space. In 2010, a workshop was convened to consider whether planetary protection measures and practices should be extended to protect planetary environments within an ethical framework that goes beyond “science protection”. Previous planetary protection policy had been aimed at avoiding the contamination of planetary environments by biological contaminants or terrestrial microbes that could compromise current or future scientific investigations, particularly those searching for indigenous life. Spacecraft have been crashed into a number of planets as well as our moon. So as we continue to send probes to the very edge of our solar system, perhaps we are seeding these worlds with the basic volatile elements that could in a distant future lead to the evolution of more advanced life forming. Or perhaps as early settlers to foreign shores on Earth introduced diseases with devastating consequences, what effect could any nasty little hitchhikers have on the destiny of whatever life may already exist. Mercury – so much known yet so much to learn! We now have detailed high-resolution maps of Mercury created from the hundreds of thousands of images taken by MESSENGER. The launch of the European Space Agency’s BepiColomboplanned mission to Mercury is planned to take place during a one-month long window from January 27, 2017. This is a joint mission with the Japan Aerospace Exploration Agency (JAXA) and should enter Mercury orbit in January 2024 carrying two separate orbiters, the Mercury Planetary Orbiter (MPO) operated by ESA and the JAXA designed Mercury Magnetospheric Orbiter (MMO) carried by the Mercury Transfer Module (MTM). One of its tasks will be to observe the 16m crater made by MESSENGER when it impacts at around 3.9 km/s (about 14,040 km/h). Scientists will be monitoring this fresh crater in order to identify the process of space weathering—the erosive effect of radiation and tiny meteorite strikes—in action. Audi has been active in the development of CO2‑neutral fuels – Audi e‑fuels – since 2009. Audi is also conducting joint research into the synthetic manufacture of Audi e‑gasoline with Global Bioenergies, of France. 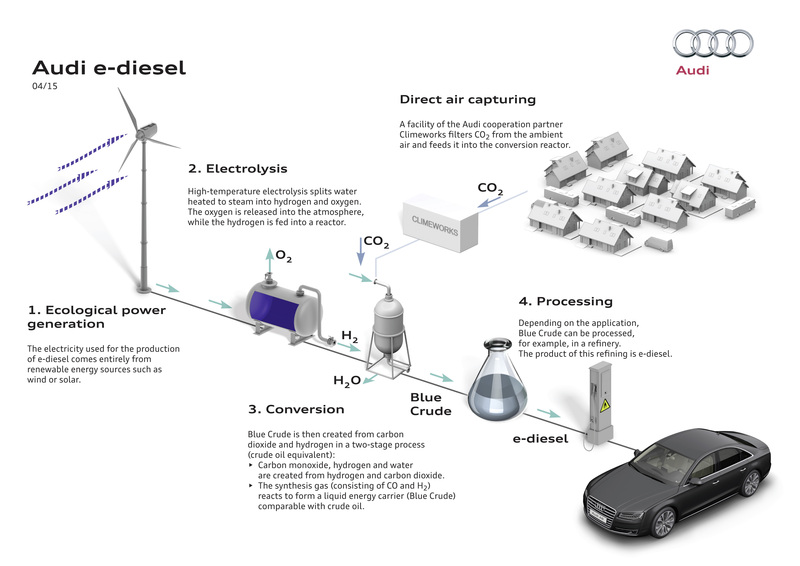 In a further project, Audi has joined forces with the U.S. company Joule, which uses microorganisms to produce the synthetic fuels Audi e‑diesel and Audi e‑ethanol.means it is readily ignitable. Saturday’s Nepal earthquake has destroyed housing in Kathmandu, damaged World Heritage sites, and triggered deadly avalanches around Mount Everest. The death toll is already reported as being in the many thousands. Given past experience, it would not surprise if it were to reach the many tens of thousands when everyone is accounted for. Nepal is particularly prone to earthquakes. It sits on the boundary of two massive tectonic plates – the Indo-Australian and Asian plates. It is the collision of these plates that has produced the Himalaya mountains, and with them, earthquakes. The April 25 quake measured 7.8 on the moment magnitude scale, the largest since the 1934 Bihar quake, which measured 8.2 and killed around 10,000 people. Another quake in Kashmir in 2005, measuring 7.6, killed around 80,000 people. These quakes are a dramatic manifestation of the ongoing convergence between the Indo-Australian and Asian tectonic plates that has progressively built the Himalayas over the last 50 million years. They are but one reminder of the hazards faced by the communities that live in these mountains. Other ongoing hazards include floods and monsoonal landslides, as exemplified by the Kedarnath disaster of 2013 which killed more than 5,000 people. Earthquakes occur when strain builds up in Earth’s crust until it gives way, usually along old fault lines. In this case the strain is built by the collision or convergence of two plates. A number of factors made this quake a recipe for catastrophe. It was shallow: an estimated 15km below the surface at the quake’s epicentre. It saw a large movement of the earth (a maximum of 3m). And the ruptured part of the fault plane extended under a densely populated area in Kathmandu. From the preliminary analysis of the seismic records we already know that the rupture initiated in an area about 70km north west of Kathmandu, with slip on a shallow dipping fault that gets deeper as you move further north. Over about a minute, the rupture propagated east by some 130km and south by around 60km, breaking a fault segment some 15,000 square kilometres in area, with as much as 3m slip in places. The plates across this segment of the Himalaya are converging at a rate of about 2cm this year. This slip released the equivalent of about a century of built up strain. While the occurrence of large earthquakes in this region is not unexpected, the seismological community still has little useful understanding of how to predict the specific details of such ruptures. While the statistical character of earthquake sequences is well understood, we are still unable to predict individual events. Questions as to why such a large earthquake, in this specific location at this time, and not elsewhere along the Himalaya, continue to baffle the research community, and make for problematic challenge of better targeted hazard preparedness and mitigation strategies. But with each new quake researchers are gaining valuable new insights. As exemplified by the ready availability of quality data and analysis in near real time provided by organisations such as the United States Geological Survey and Geoscience Australia, the global network of geophysical monitoring is providing an ever more detailed picture of how the earth beneath our feet is behaving. Using new digital topography datasets, new ways of dating landscape features and by harnessing the rapidly growing power of computer simulation, we have been able to show how large historical ruptures and earthquakes correlate with segmentation of the Himalayan front reflected in its geological makeup. This is shedding new light on so-called seismic gaps, where the absence of large historical ruptures makes for very significant concern. You can read our latest research here. The most prominent segment of the Himalayan front not to have ruptured in a major earthquake during the last 200–500 years, the 700-km-long “central seismic gap” in Uttarakhand, is home more than 10 million people. It is crucial to understand if it is overdue for a great earthquake. If your digital world seems to suffocate you at times with its strangling cacophony of constant information, we recommend this refreshing odyssey courtesy of NASA’s Hubble Space Telescope, pulling us into the wondrous eye of the cosmos. NASA technicians created this thrilling fly-through visualization based on images obtained by the Hubble Space Telescope for its 25th anniversary. The inspiring video teleports voyagers straight into the radiant center of the Gum 29 nebula toward the sparkling star cluster Westerlund 2 and its infinite beauty. Built by NASA and the ESA, the Hubble Space Telescope was first launched aboard the space shuttle Discovery 25 years ago today. I’m a Xenoarcheologist. I dig up the remains of ancient alien societies and then try to figure out what it is that I had found. 9,999 out of 10,000 times it’s broken, degraded and unusable garbage. The few gems that I find fund missions like this one; to the third planet of a K class star. An orange dwarf that is less luminous than our sun. Salsbilla is Earth-like , with carbon-based life, close enough that we wear our encounter suits while xenobio makes sure we’ll be alright to go shirtsleeves or not. Gravity is 5.88 m/s2, about 5% lighter than my home planet. We had made base camp on Salsbilla’s major continent, near the structures. The planetary survey had found this planet forty years ago, and it’s only now that we were able to build a wormhole gate to it. Our initial orbital survey found a ton of sites, so we picked the one closest to the equator and landed. Now I’m standing here in this canal, and I’m looking at the most intact xeno-site I have ever seen on a planet. OK, it’s a large moon around a super Jovian. It’s smaller than Terra and bigger than Mars. 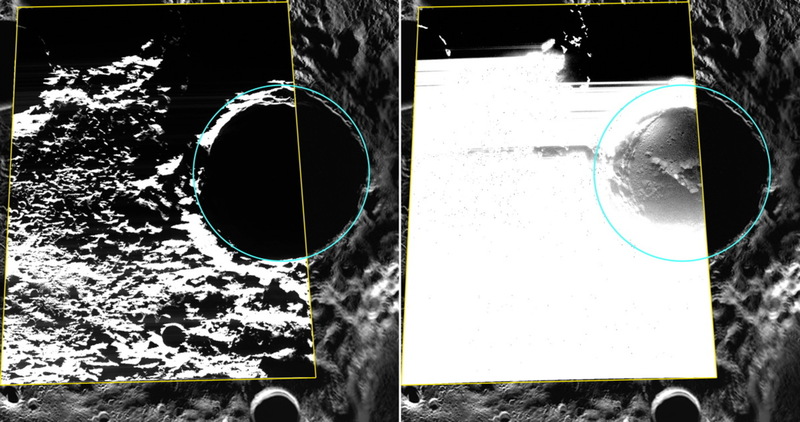 We find more intact sites on proper vacuum scarred moons, but then that’s to be expected. “That would be interesting,” says Hanson. He has a wicked sense of humour. “It will be when they pounce on us with whatever limps or weapons they posses, Hanson. I would like to see how you like that.” I say. The time we landed coincided with the Orange spot in the sky moving to the other side of the planet so it was growing dark pretty quickly. The combination of the dying light and the presence of three rising moons in the orbit created phantasmagoric shadows cast far and wide from the old rusty structures. Soon the sun was gone and with it the beautiful aura. The shadows became skewed and ghost like. The night vision glasses did not help matters. Hanson and the team were already poking around and collecting samples. I walked up to the most intact structure to begin my work and see what I could salvage. Usually my tomahawk was enough to destabilize different types of metallic elements, be they be made of lead or complex carbons surpassing diamond. It’s usually an easy job. This was different and it’s ressilience baffled me. The harder I tried to punch through, the tougher it got. I seemed to be actually washing the grit off it’s surface. ”Hanson, I think we have found our match. This is a real gem.” I shouted over my shoulder. I rechecked my equipment just to make sure it was not a malfunction. This was bound to be the hardest and the strongest element I had ever seen in my whole life. It was going to fetch a tidy sum once we broke it down. In every other mission, we collected samples and took them back to the ship for analysis. We then figured out whatever we were dealing with and it’s appliance in the confederate planets. This could build structures to withstand anti-matter bombs. Hell, we could even build dyson spheres and prevent stars from going nova and obliterating every thing surrounding them. It could be the discovery of the century! The excitement let down my guard and made me forget that when we landed the structures seemed extraordinarily intact. It was as if the civilization which had built what I presumed to be cities had left in a hurry. The structures were not bulging and I decided to bring the lab to them. I checked my phone to activate the drone app and feed instructions to find it completely dead. This was not possible. Not with a phone powered by broken down atoms of Uranium 235. No known object could breach the containment field holding them at the back without extensive knowledge of it’s constituent elements. This thing was powered to outlast any known civilization. Long after we were gone it would still be beeping. It did not just go kaput, not without some outside powerful intervention. The good news was that the team had not dispersed far and wide and I quickly assembled them to the base of the ship. Nearly half of all devices capable of producing electrons were off with the power completely dead. I was faced with a dilemma. Here was a planet rich with the strongest element I had ever known but it was also sucking the power out of our equipment. Did I say, the robotic drones were dead too. That meant even if we found a way of breaking through, moving copious amounts would be a difficult task. I decided to let every one get a good nights sleep and try to figure out everything in the morning with fresh minds. The worse was yet to come. I was opening the door to my cabin when the chief engineer rounded up the corridor running and out of breath. This was quickly turning into my worst nightmare. I had not bargained for this. Sleep was going to wait. I immediately put the ship on an alert mode. As of that moment there was no way we were leaving Salsbilla. A dead ship meant that soon we were going to run out of supplies and die. The ship was the only thing capable of releasing anti-neutrinos and activating the wormhole once were docked on the orbit. We were farthest from the orbit you could get. Sending distress beacons was out of question. We were more than 100 light years away from the nearest confederate planet or ship. I took comfort in the fact that other than utter lack of any mobility every other ship’s function was still great. The view panel on my lift flashed red and the automatic distress voice came on announcing that the hull was degrading. Either the atmosphere was corrosive or something was having our ship as a midnight snack. I found Hanson already in the bridge staring into the view screen like it was the first time he was seeing it. “Doc, didn’t I say it was bound to an interesting adventure?” He asked. His explanation dimmed my hopes. A hull camera brought one to the main view screen. It looked like a giant brown spider with a purple crystalline structure sticking from it’s back. A sphincter below a giant front eye had a gooey slimy liquid flowing out and corroding our hull slowly. Our options were limited. Sit down and stare as our hope of ever rejoining civilization was consumed or pick up carbines and blast the mites to hell. We chose the later. A bunch of two dozen scientists holding guns and chanting like deranged soldiers does not inspire hope or scenes of heroism. We opened the hatches and spread out. A few minutes into the fight revealed how useless an endeavour it was. We were feeding the mites laser energy directly and they were lapping it up like a baby on a breast. The first option didn’t seem so bad at all now. We decided to regroup on the bridge to figure out our next move. The first person to step on the bridge was blown up to smithereens by a powerful hand held gun. The aliens did to my thigh what I had been trying to do to the structures all along. Punch a clean hole through. The mites did not even own the planet. They were pets. That was my last realization before I passed out.